The first China International Import Expo kicked off at the Shanghai National Convention and Exhibition Center on November 5th. Absen’s products shine beautifully in this world-class event! During the 6-day event, 172 countries, regions and international organizations from the five continents have showcased their development achievements and international image. More than 3,600 companies from different countries have held heated discussions and sought for common development with buyers from China and overseas. 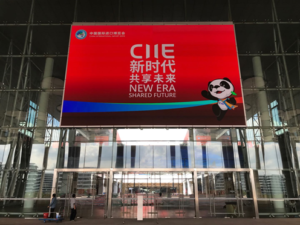 As the first state-level exhibition in the world promoting imports, CIIE provides a new platform for deepening international economic and trade cooperation, promotes economic globalization, and is devoted to making greater contribution to building a community with a shared future for mankind. Absen’s LED screens play an important part in the update of Shanghai National Convention and Exhibition Center before the Expo. Faced with a very tight schedule, Absen showed its brand confidence and responded instantly to this challenging task of the completion of such large area LED screens all over the Center. A quick-respond project group has been gathered, which consists of a manufacturing team, an installation team and a service support team during the Expo. 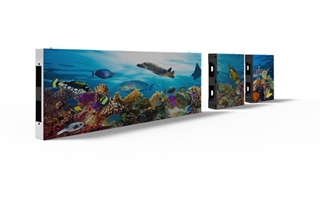 Relying on great manufacturing ability of Absen’s Huizhou Production Base that features “automatic, elaborate, high-efficient”, all the LED display screens have been produced within a month. In spite of all the difficulties, Absen’s engineers have managed to complete all the installation and commissioning work in only 10 days and make sure that all the Absen’s screens on site work smoothly before the CIIE. 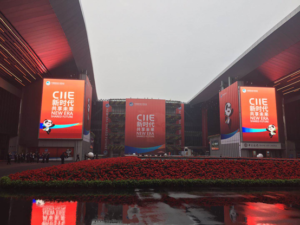 During the 6 days of the CIIE, Absen’s engineers of the support team have stuck to their positions and ensured the perfect performance of the screens. Absen’s indoor product K3 screen has become an eye-catching spot at the main entrance to south gate of the Shanghai National Convention and Exhibition Center. Compared with the traditional cabinet, K3 is in a slim design of 20% lighter weight. 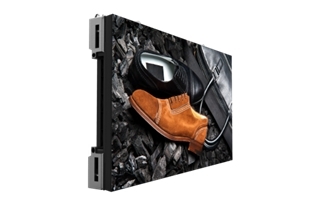 With a thickness of 76mm, 250mm*250mm magnetic modules, K3 is born to be a choice for wall-mounted and rear installation & maintenance, which can save space of the steel structure. And it is more than beautiful in the front view, through the glass wall, it looks clean and tidy from the back view. 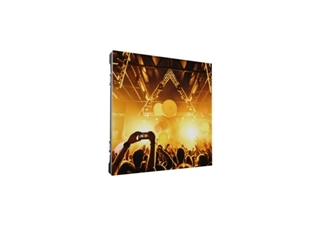 As one of the star OOH products, XD series features high contrast ratio and shows perfect visual performance. XD series is designed in the same platform with a pixel range of 4.44mm to 10mm, which can satisfy different needs of viewing distance. Waterproof is one of the most critical design for outdoor LED products. The four-layer waterproof structure of XD series can protect its internal structure from humidity efficiently. The design of drain-hole, fan-less power box and the sealing process make the product extremely water resistant. Facts speak louder than words! Absen’s XD series were still shining beautifully in the rainy days during the CIIE. Abseners believe products and service come together. Absen shows its professionalism not only from the perfect products but also considerable service. With an 8-member engineer team on site, Absen’s engineers stuck to their positions and kept eyes on the screens during the operation all day to ensure the operation of the screens and they can respond quickly in case of any emergency during CIIE, whose actions is a strong evidence of Absen’s “responsible” culture value.